If you haven’t been to Friendship’s northern border of Penn Avenue lately, you’re in for a sweet surprise. The transformation, from a blighted area to a vibrant arts district, is well underway, courtesy of the Penn Avenue Arts Initiative (PAAI), a strategic partnership between the Friendship Development Associates and Bloomfield-Garfield Corporation. Today, many of Pittsburgh’s best-kept secrets, from art to architecture, can be found in Friendship. The gutsy transformation has been driven by the PAAI, a formidable group which helps artists buy and renovate properties, provides technical assistance to artists, and promotes them as well as the neighborhood. The group even connects artists to local youth and their families through fun events and workshops that benefit all involved. The liveliest time to visit this vibrant neighborhood is the first Friday of each month, for the PAAI showcase, Unblurred, when the area’s galleries and businesses throw open their doors to host a variety of events, from openings to art workshops. Despite gloomy weather and the threat of rain at the September event, music filled the air and hundreds of people jammed the galleries in the festive gathering on Penn Ave.
As you work your way down the street (Penn Ave, that is) keep on eye on the building walls of Friendship where some of the neighborhood’s most intriguing public art –such as the well-known The Bride Mural—can be found. The landmark Bridal Mural, designed and created by the late Judy Penzer and Jill Watson, fools the eye by depicting a continuation of the row of buildings next to it. In 2001, “The Gateway,” mural was created by local artists at 5149 and 5150 Penn Avenue to represent the mission of PAAI – bringing the arts on both sides of Penn Avenue together via the street itself. 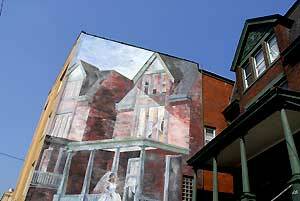 Another notable mural is at 4908 Penn Avenue. Titled “Today’s Heroic Paragon,” it was created by Kevin Fung in 2003 in memory of a resident. Many of the murals are the product of the Sprout Fund, a much-admired foundation located in Friendship that funds arts and other area projects that enliven the city as well as stimulate economic development by making the region attractive to young people. The Art of Dance. And Foursquare. The eastern end of Penn Avenue in Friendship is home to Attack Theater, one of Pittsburgh’s most innovative performing arts groups. In studio space at the corner of Penn and Mathilda, the dance troupe holds occasional informal performances in addition to offering modern dance classes to the community on Tuesdays. Unblurred attendees wanting to nurture their inner child can stop by for Game Night, to play foursquare, 3D tic-tac-toe, and Connect Four, and enjoy intermittent performances. Further along Penn Avenue, you’ll find a group of modest galleries where hipsters – with a few adventurous suburbanites mixed in – spill out onto the sidewalk. 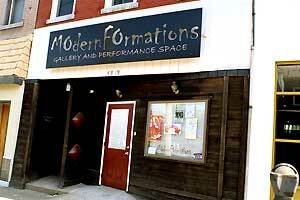 Visitors to Modern Formations can settle into one of the comfy couches to enjoy a performance by local musicians, or peruse the pieces by Pittsburgh artists that grace the gallery’s purple walls. Next up is Garfield Artworks, which shows local, regional and national artists, features a 100-foot-deep floor plan that lends itself to a multitude of uses, from performances to poetry readings to private parties. At this point in the trip down Penn, a quick detour down Winebiddle Street is worthwhile to see the Waldorf School of Pittsburgh, located in one of the neighborhood’s oldest and most beautiful buildings. Originally a private residence that was converted into a convent for sisters of the Ursuline order, the building now houses the private K-8 school that moved to Friendship from the South Side in 2003. This historic landmark still hosts private events, in addition to its everyday function. Back on Penn Avenue, head for the Clay Penn, with its storefront graced with thousands of mosaic tiles, many designed by Unblurred participants in a workshop. Owner and artist Laura Jean McLaughlin showcases her own work in the first-floor space, along with exhibitions by other artists. Soon, community classes and workshops will be offered here, too. Next stop? Studio 5013 where, at any time, you can view a window display of one of many local artists since it’s illuminated for nighttime browsing. Behind the gallery curtain, artist Laura Shaffalo has done a tremendous job restoring the building’s splendor in creating her own live/work space, refinishing the building’s original pine floors and preserving architectural features such as the French doors. There’s still room for improvement but The Penn Avenue Arts District continues to blossom and grow with each passing month. 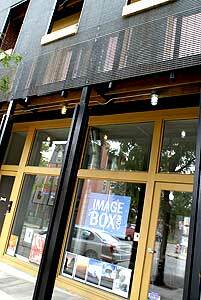 Since July, Penn Avenue has seen the opening of four additional galleries: IMAGEBOX at 4933 Penn Avenue, < c > space at 4823 Penn, ON Gallery at 5005 Penn and 5151 Penn Gallery. 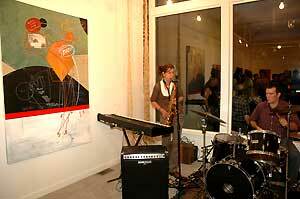 At < c > space, a live band entertained a throng of visitors during its opening event September 1st. Guests were treated to art and music on the first floor, along with an appetizing spread of food and drinks, while upstairs the hip, renovated living quarters were open for viewing. On September 14th, ON Gallery plays host to noted author, Mary Gaitskill, in a Pittsburgh Arts & Lectures event. Hungry? You’re in a great spot for some of the city’s best offerings in ethnic fare. Although the selection is small, the cuisine is top-notch. The locals swear by the curry at People’s Indian Restaurant, and Pho Minh is one of Pittsburgh’s few spots for authentic Vietnamese. Those with less exotic tastes can grab a slice with just the right amount of grease without parting with too much dough at Vince’s Pizza or Calabria’s. A little farther up the street, past two institutions found in nearly every urban neighborhood – the dollar store and the funeral home – lies one of Penn Avenue’s most eclectic spots, the Quiet Storm. Complete with a vegan-friendly menu, an abundance of toys for folks under 10 (and ample space in which to play with them), and a magazine selection that puts the corner newsstand to shame, this nuisance bar-turned-coffeehouse draws in a mélange of characters from all over the city, whether a family stopping in for Sunday brunch or a doctoral student hunkering down to work on his thesis. 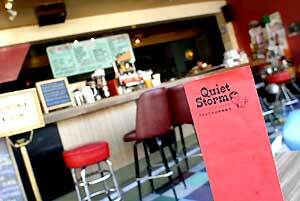 The menu alone makes the Quiet Storm a must to visit, but those who need extra motivation might find it in the live performances hosted by the coffeehouse on Friday and Saturday nights. Another option within walking distance is Silky’s Pub, a cozy Liberty Avenue bar that gives patrons the opportunity to brush up on their shuffleboard skills while sipping a beverage. At the end of Friendship Avenue, the popular Sharp Edge features such an extensive collection of Belgian beers that the owner has been knighted in Belgium. Across the street from the Quiet Storm is the highly regarded EDGE studio, a cutting-edge architecture firm that regularly brings artists of international stature regularly into their gallery. Reaching the eastern end of Penn Avenue, you’ll find one of the nation’s best glass facilities, and possibly in a class by itself, the Pittsburgh Glass Center. Housing large studios in space that formerly served as a car showroom, PGC is known across the country for the quality of art it produces–American Style magazine recently noted that it put Pittsburgh on the map for glass– and the community is encouraged to participate in the process. The facilities are impressive: eight glory-holes, a flame-working and a cold-working studio, natural gas and propane hand-torches and a roomy gallery to display the stunning glass work creations. A variety of classes you won’t find elsewhere are offered by masters in their art form, from glassblowing to bead making, and participants of all skill levels can find a course that fits their experience. More classes of a different variety can be found just down the street from the PGC. 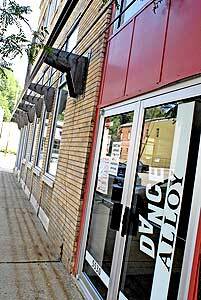 The Neighborhood Dance Center, home to Dance Alloy Theater, provides space for one of the region’s most comprehensive community dance and fitness programs as well as their own professional modern dance company. Courses grouped by age allow a range of participants from toddlers to grandmas to enjoy activities from ballet to tango to Pilates. There’s no better place in Pittsburgh to get moving – and meet new friends. The company performs on a biannual home season with smaller showings throughout the year. What’s the best way is to get to this evolving neighborhood? Public transportation choices are plentiful. Eight PAT routes travel through one of Friendship’s main thoroughfares. If you choose to come by car, street parking is almost always available as well, if not on Penn, then no more than two blocks away on one of the cross streets. Here are the main PAT routes to get you around the neighborhood. Routes 77A, 77B, 81B, 86A and 86B also serve East Liberty shopping areas. While the first Friday of the month is when Friendship is showcased at its finest, anytime is a good time to visit this up and coming neighborhood.